Let’s face it; trying to sell your car isn’t always an easy task. You have to think like a salesperson (*shudders*), put all this effort into making an ad, and then actually talk to people and try and convince them to buy it – ugh, people! 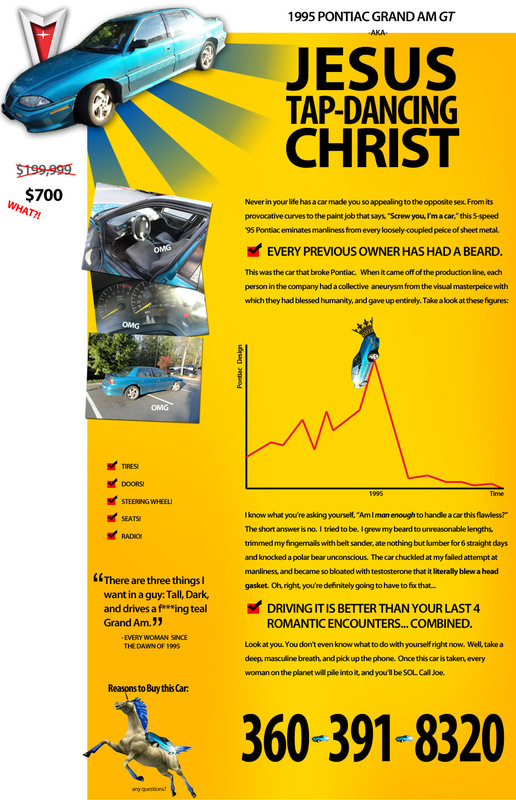 Obviously some people out there find the effort worthwhile, as is evident from the following very creative private sale car ads… check them out for a bit of inspiration (or a laugh). And for those of us who like to do things the simple, easy way, contact Are You Selling if you want to sell your car instantly and without a spot of hassle. The “Buy My Barina” YouTube video cropped up on the Internet a few months back, and quickly went viral. David Johns, a local Aussie no less, created a fully-fledged website and video to try and sell his 1999 Holden Barina. Using dramatic techniques that imitate those of most car manufacturers trying to flog brand new, flashy vehicles, Johns produced a hilarious clip that got him plenty of joke offers and a few real ones via the Twitter hashtag #buymybarina. He eventually sold it to NRMA Insurance, and donated proceeds from the viral video to the Cancer Council. Win win for everyone! Only a couple of months before our Aussie hero tried to sell his little blue Barina through brilliant YouTube marketing, a Swede named Christoffer Castor had a similar approach for his 1993 Volvo. Although he has had less success in actually selling his vehicle, he’s still drawn over 1.8million views between his original Swedish and updated English versions. Check out the hilarity here. It’s not all viral YouTube clips though… Yes, who can ever talk about creative ads without delving into the sometimes frightening world of Craiglist. There are tonne of funny, interesting, and even horror stories that regularly come out of Craiglist, and these two looking to privately sell their cars are certainly noteworthy. This advertisement for a 1999 Toyota Camry really went all-in. It didn’t shy away from highlighting some of the bad features (dents on both sides? No problem! ), whilst also managing to put a bit of a positive spin on the whole thing. Here are just a couple of the image panels he used. In similar sarcastic/awesome style, this Craiglist user had a field day selling his 1995 Poniac Grand AM GT. Enjoy!